In today’s fast pace world, food ordering apps acts as a boon to food lovers as it helps you to taste food from restaurants which are away from your house. You can tease your taste bud with a variety of foods in just a single tap from your smartphone and thus saving your lot of time which you have to waste to bring the food from the restaurant. If you order food from food ordering app, you have to wait for a while and ordered item will be delivered to you. It is beneficial for people who came at night after tiring office work and spend a lot of time to cook food for dinner. Online food ordering apps has made everything simple as you just have selected the food from any restaurant and that food will be directly delivered to your home. Most of the foods ordering companies accept payment in form cash on delivery, mobile wallet payment or online cash transaction. These apps is mostly popular among living away from their home especially office going people and tech-savvy individuals who find it difficult to order food for themselves. With one single app one can get reach to many restaurants in their city thus these apps are flourishing in the market. Swiggy is the most popular online food ordering app in India, and it promises to deliver the food within 45 minutes. The interface of this app is very simple, and it allows you tracks the movement of the delivery guy who would be bringing your food. Currently, this is the most successful food ordering app due to its huge amount of active user. Zomato is the pioneer in restaurant search technique as they are the first company to popularize this platform in India. With their app, finding a restaurant in cities has become simple, and they even allow you to order food from those restaurants through their app. It offers chat option where you can talk with the customer service regarding your order. This is another popular food ordering app that delivers your food from your favorite restaurant to your doorstep. Food panda is one of the oldest and most trusted food ordering app. This food delivery system is currently available in all major cities and gradually making their way into the top tier list. It also provides various offers occasional to all its users. I personally use food panda while ordering food online and save a lot of money using coupons for Foodpanda. So I would recommend all to use this app and get tasty food at cheap rates. Tasty Khana is not as popular as other leading food delivery app in India, but it has almost 7,000 restaurants registered in their database. Food panda is the current owner of this company, and this app works in the same fashion like other food ordering apps. Brekkei is same as other mobile app but the only thing they deliver is breakfast, and it is only available in Bengaluru. This food delivery system is responsible for delivering some mouth watering breakfast to its users, and you can only order breakfast between 7 am to 11.30 am. 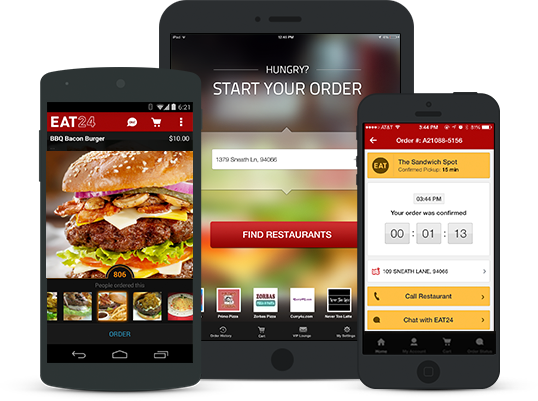 Just Eat is quite a popular ad in all major cities, and it lets you order food from nearby restaurants. The specialty of this food ordering app is that it offers you a discount when you make payment through online transaction. They just provide codes, and you have to apply them before you make the final payment. Faasos is a popular name among young people in big cities as it serves some delicious rolls and wraps. The unique part of this food delivery system is that it comes from the dedicated kitchen of Faasos with the availability of both vegetarian and non-vegetarian food. Domino’s is the most popular pizza delivery food chain in India, and through its app, you can order any type of pizza. Apart from pizza, you can even order other delicacies served by this company. This is a quirky food delivery system that only serves food made by renowned chefs of the hotel industry, and you have to wait few hours before it gets delivered to your doorstep. The menu on Holachef is not constant, but you can stay assured that you will get most delicious food on your plate. Food cloud is a small scale food delivery system that includes a menu of foods made by home chefs of Delhi city. In the menu of food cloud, you will find various items in main course and desert. The ordering and delivery facility is same as other food ordering app and works smoothly on all smart phones. So this is the list of top 10 online food ordering apps. Here you can get all kinds of food easily along with delivery facilities. I tried TinyOwl in India and they were good. Not heard of others you’ve mentioned here. Previous Previous post: VLCC DNA Slim – A scientific weight loss program based on your DNA!